In 2015 over 3,000 unique users from Hammersmith High Street registered over 180,000 session. The district of Hammersmith is small but is a densely populated and vibrant borough. Boasting a large number of retailers, fashion outlets and entertainment businesses, the benefits to the district of a location specific digital loyalty app were immediate. 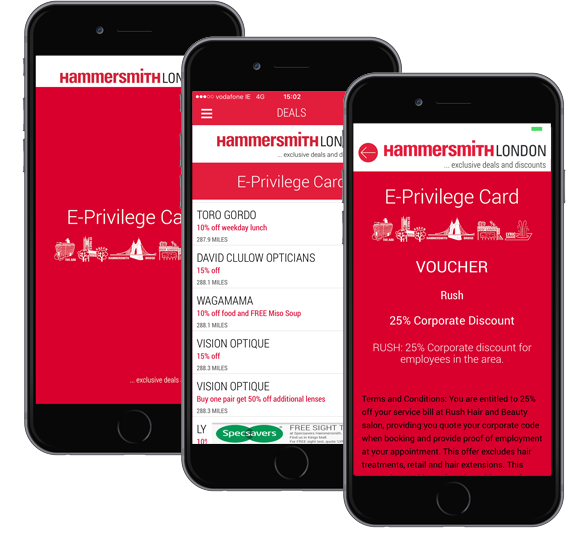 Our E-Privilege system delivers a complete electronic loyalty programme, enabling the consumer to review and avail of numerous promotional and locality rewards via one centralised solution. With a very institutive frontend, the consumer can search for deals by category and/or location and redemption of the deal could not be simpler. Unlike many other digital loyalty apps, our solution provides the retailer with comprehensive analysis of usage levels, user profiles and consumer demand. This data provides very valuable information regarding the consumer and their demands directly to the businesses, empowering them to make informed decisions regarding their market. Driven by our CMS, the listed businesses can on-demand launch and/or amend a promotion within minutes. In 2015 over 2,000 users registered over 110,000 session.